Thank you for your interest in signing this petition, which has now been signed by more than 30,000 American scientists. Signatories to the petition are required to have formal training in the analysis of information in physical science. This includes primarily those with BS, MS, or PhD degrees in science, engineering, or related disciplines. 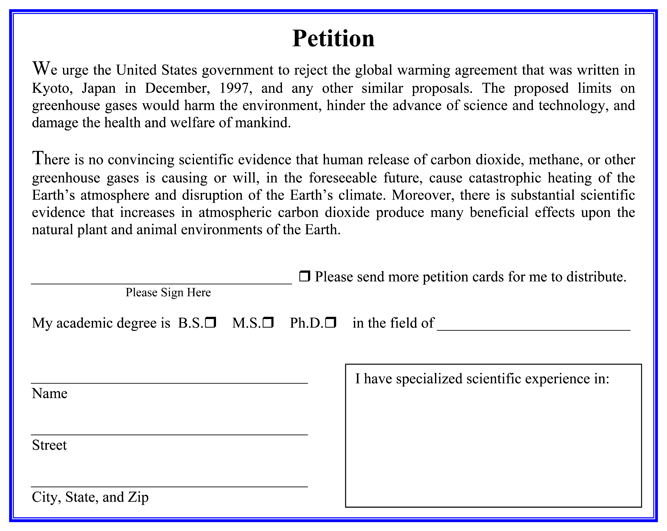 Please print the petition, fill out the credential section, and sign as indicated. In order to obtain a pdf copy of the petition, click here. Please mail your signed petition to: Petition Project, P.O. Box 1925, La Jolla, CA 92038.